After leading the first day of Japan's biggest race the entire way, defending champion Aoyama Gakuin University did it again on the return trip to become the first school in 39 years to lead the Hakone Ekiden start to finish. 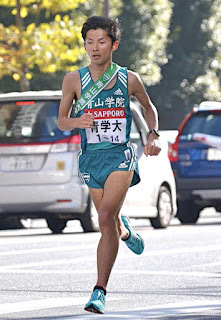 Starting the day with a margin of 3:04 over 2015 National University Ekiden champion Toyo University Aoyama Gakuin had some room for error over the 5-stage, 109.6 km Day Two race, but even so head coach Susumu Hara took a major gamble in putting unknown Yuji Onoda, a 1st-year with no university ekiden, half marathon or 10000 m credentials and a 5000 m best of only 14:15.70, onto the day's leading stage, the 20.8 Sixth Stage with 800 m of brutal descent. In doing it he also showed why is the best current coach in Japan, as Onoda responded to the challenge by tying the course record in 58:31. For Toyo to have a chance it needed to make up serious ground on the Sixth Stage, but when the exchange was over Aoyama Gakuin's lead had grown to 4:14. Barring anything unexpected Onoda had nailed it down. From there Aoyama Gakuin was never in danger. 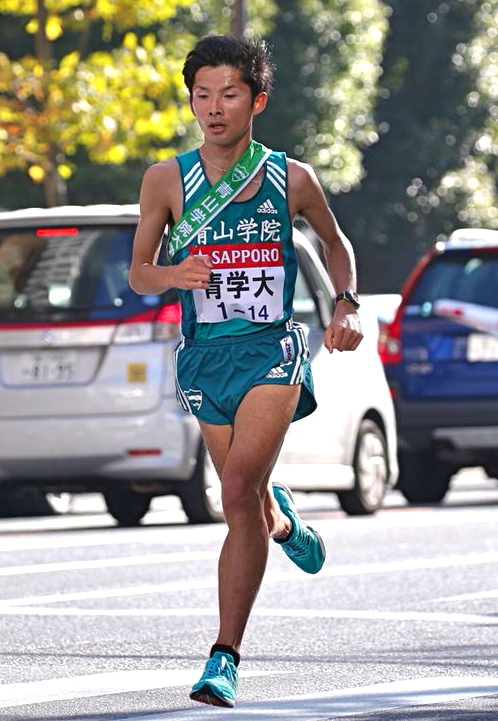 2015 World University Games half marathon gold medalist Yusuke Ogura won the 21.3 km Seventh Stage to stretch the lead out to 4:52 and 2nd-year Yuta Shimoda, Japan's fasest-ever 18-year-old in the half marathon with a best of 1:02:22, took the lead to 7:03 with another win on the 21.4 km Eighth Stage. Unseasonal temperatures rising into the mid-teens meant the later runners had trouble matching the fast times on the first day; Aoyama Gakuin's next man Yuki Nakamura was only 7th on the 23.1 km Ninth Stage, losing all of 25 seconds to Toyo. 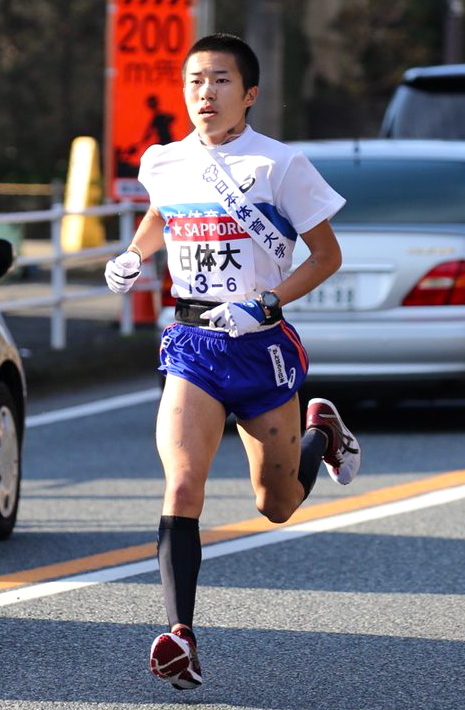 Coach Hara told anchor 4th year Toshinori Watanabe to run a conservative pace on the 23.0 km Tenth Stage but Watanabe went out near course record pace, fading slightly in the heat but still winning the stage to bring Aoyama Gakuin home in 10:53:25 for its second-straight Hakone title. Its winning time was the fourth-fastest in Hakone history, and along with the overall title Aoyama Gakuin had the fastest times on both the first and second days. With only six out of ten individual stage wins it wasn't quite the equivalent of a perfect game in baseball, but after 4th-year Kazuma Kubota handed off in 1st at the end of yesterday's opening stage no one was ever in front of an Aoyama Gakuin runner, a feat no team has achieved since Nittai University in 1977. Post-race Hara again stressed that the team's measure of success all throughout the year since its first title was the athletes' level of happiness. After a long-term development plan he detailed to JRN back in 2012 centered around taking his group of 2015-16 4th-years to the Hakone win, Hara is now faced with the graduation of Ogura, Watanabe, Kubota and uphill specialist Daichi Kamino. Post-race he was optimistic about next year, with six members of this year's team returning and many more in reserve. "We're at a point where it's a given that our runners are going to run 13 minutes for 5000 m and 28 minutes for 10000 m," he said. "The way forward in Hakone is to develop both speed and distance. Other teams are strong too, but with this approach we can continue to produce a competitive and happy team." After taking 2nd and 3rd on Day One Toyo and 2015 runner-up Komazawa University held almost even relative to each other throughout the day. Toyo just missed a rare sub-11-hour clocking in 11:00:36 for 2nd, while Komazawa was 3rd in 11:04:00 to claim its 16th top 3 finish in the last 20 years. Ranked 2nd pre-race, Waseda University recovered from a rocky start on the first two stages to take 4th in 11:07:54 thanks in part to a win on Day Two's longest stage by 3rd-year Koki Ido. Tokai University lived up to its pre-race ranking at 5th in 11:09:44. The top ten teams in Hakone earn an invitation to the fall's Izumo Ekiden and a guaranteed place at the next year's Hakone Ekiden, powerful motivation back from the leaders throughout the second day. This year the race for the seeded bracket was especially turbulent, Nihon University, Takushoku University and Josai University all falling from grace after finishing inside the fold on Day One, other teams going back and forth, and a few more rising to the challenge. Juntendo University moved up from 7th to 6th thanks to strong runs from seventh man Shoi Inada and anchor Naoya Sakada. Nittai moved up from 13th on Day One to 7th in the final standings thanks to the momentum set up by a course record-setting run down the mountain by its Day Two leading man Kiyohito Akiyama. A possible Hakone winner two years from now, Yamanashi Gakuin University had a stressful second day as it fell from 4th to as low as 9th before recovering to its final position of 8th late in the race. Ranked only 16th, Chuo Gakuin University had one of the best team performances in the field, starting Day Two in 14th and running beyond themselves to rise to 6th by the Eighth Stage. 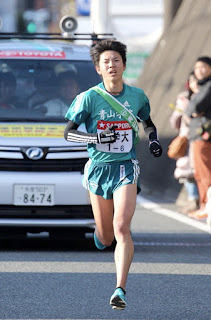 Anchor Takahiro Ogawa gave Chuo Gakuin a scare when he was reduced to a stagger with 2 km to go, losing enough time for the team's position to fall to 9th but ultimately keeping them inside the top 10. 8th-ranked Teikyo University was locked in a race for the final seeded position with 13th-ranked Nihon throughout the day, getting ahead on the Eighth Stage but not safe until late in the anchor stage. Nihon finished 1:29 back behind the non-counting Kanto Region Student Alliance team as the unlucky first team to get knocked back to October's Yosenkai qualifier. Half a second per kilometer faster by each runner and it would have been a different story. Along with Nihon, Takushoku and Josai curled up and the second day to lose their chances at a seeded finish. The biggest breakdown, however, came from #6-ranked Meiji University. Running as high as 2nd early on it finished Day One in 18th after disastrous Third and Fifth Stage performances. Meiji's Day Two runners were solid throughout, ranking 10th on Day Two time but unable to pick up enough ground to move higher than 15th. First-timer Tokyo Kokusai University surprised by finishing 12th on Day One, well within sight of the top 10, but Day Two give them a hard dose of reality as they fell to 18th. Akiyama and Onoda on the downhill Sixth Stage were two of the highlights of Hakone's second day, but it also delivered on its potential for drama and heartbreak. On the Seventh Stage unknown 18-year-old 1st year Yuya Tanaka, running for last-place Jobu University, got into serious, serious trouble near the end of his run, clutching frighteningly at his heart as he staggered and then pitched forward to the ground. Climbing back to his feet Tanaka pulled himself upright and started running again, but his eyes were closed in pain and his head lolled all the way in to exchange zone. Of all the runners that have broken down at Hakone this was the first one in memory that was genuinely frightening. Organizers and head coach Katsuhiko Hanada can count themselves lucky that Tanaka survived seemingly intact. More benign but equally touching drama was soon to follow. On the later stages runners must get to the exchange zone within 20 minutes of the leader or else their outgoing teammates will have to start before they get there, wearing a replacement tasuki instead of the one that is supposed to be carried throughout the entire race. Turning into the approach to the final exchange zone Kanagawa University's ninth man Haruki Ono saw the remaining anchors including his teammate Kazunari Okawa lined up and waiting for the gun. Digging down with every he had Ono tried to get there first, hand outstretched holding the tasuki for Okawa to take, but was still 3 seconds out when it went off. Even nearby police officers cried out in dismay, Ono collapsing in tears at breaking his team's continuity. Although the Day Two heat cut meant the field didn't fly quite as high, overall the Hakone Ekiden continued to be a revelation in its 92nd running. As an upcoming JRN look at the last 20 years of Hakone will show later this week, there has never been this level or depth of quality, and there is no sign that it is going to stop any time soon. Almost every athlete interviewed on-air mentioned the 2020 Tokyo Olympics, including the Fifth Stage's first-ever Kenyan winner Daniel Muiva Kitonyi (Nihon Univ. ), and you can be sure that they are going to drive each other even higher until then. In the meantime, look for Second Stage winner Yuma Hattori (Toyo Univ.) and 3rd-placer Tadashi Isshiki (Aoyama Gakuin Univ.) 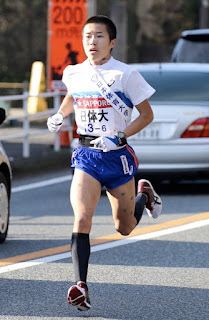 to make their marathon debuts next month in Tokyo in hopes of making the Rio Olympic team, with Fifth Stage 4th-placer Shohei Otsuka (Komazawa Univ.) doing the same a week later at Lake Biwa. On to a new era. As Hara noted a number of times, it seems like their loss to Toyo in November was the medicine they needed. I think when he saw Kubota throw down the gauntlet in the closing stages of stage 1, Hara must've felt pretty good about his chances of a repeat. Great post! Do you know what the patches are that the runners had on their necks and legs?